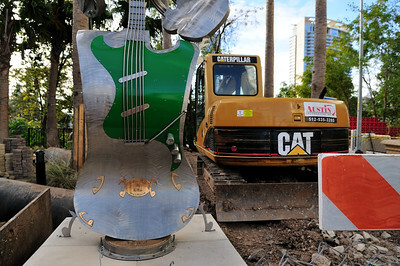 November 7, 2009 - A guitar sculpture stands in the middle of construction next to the new 360 condo building in downtown Austin. 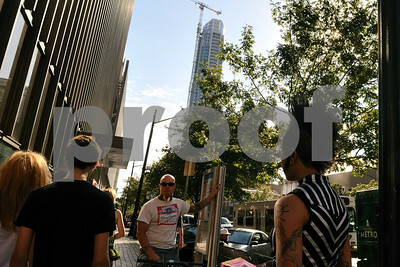 November 7, 2009 - A cluster of buildings, old and new, packed into downtown Austin between Congress Ave. and Lavaca St.
November 7, 2009 - A street scene, including a woman with a mohawk, on Congress Ave. in downtown Austin. 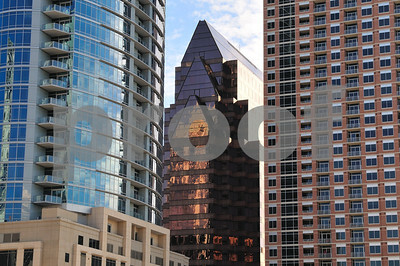 September 8, 2009 - The Austonian, a new residentail skyscraper on Congress Ave in Austin. 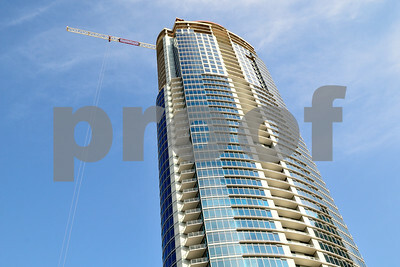 At 683 feet tall with 60 floors, the building will become the tallest building in Austin and the tallest all-residential building in the state of Texas. 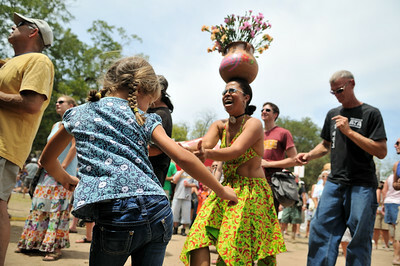 August 30, 2009 - A woman dances to live music at the 2009 Austin Chronicle Hot Sauce Festival at Waterloo Park in downtown Austin. 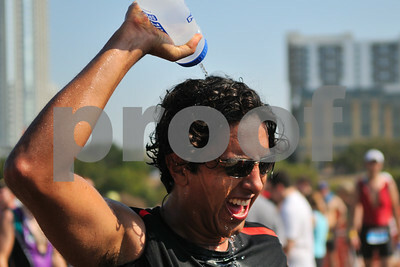 September 7, 2009 - A man pours water over his head after completing the Austin Triathlon, which runs through downtown Austin. 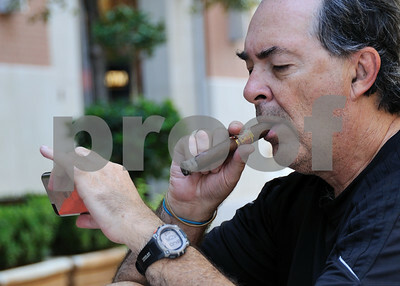 September 7, 2009 - A man relaxes while smoking a cigar and reading on his iPhone at Jo's Coffee on 2nd Street in downtown Austin. 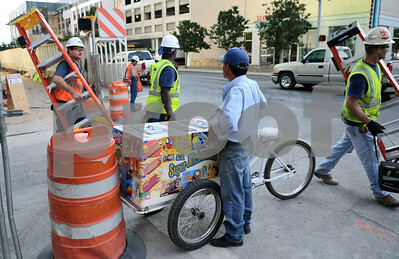 September 8, 2009 - An ice cream vendor stands by as construction workers leave for the day at the construction site for the Block 21 development. The new building will include a 250 room luxury W Hotel, 250 condominiums, a 1,000-seat venue for Austin City Limits and an expanded Austin Children's Museum. September 8, 2009 - The Block 21 development under construction as seen from the pedestrian bridge on South 1st Street. The new building will include a 250-room luxury W Hotel, 250 condominiums, a 1,000-seat venue for Austin City Limits and an expanded Austin Children's Museum. October 16, 2009 - A woman works on her homework while taking a break at the Royal Blue Grocery in the 360 building in downtown Austin. 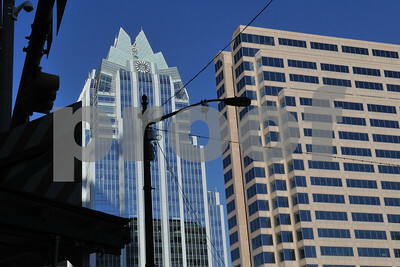 Royal Blue is a compact urban grocery store with two locations in downtown Austin. It aims to serve both workers and residents in the area and calls itself downtown Austin's corner grocery store. 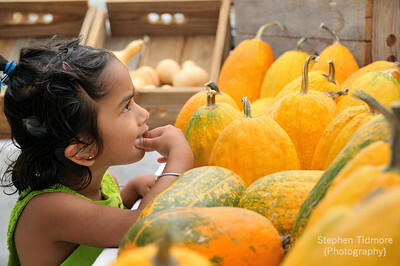 October 16, 2009 - Prapa Edge, mother of the manager of the Royal Blue Grocery in the 360 building in downtown Austin, makes Thai Papaya Salad to order. Royal Blue is a compact urban grocery store with two locations in downtown Austin. 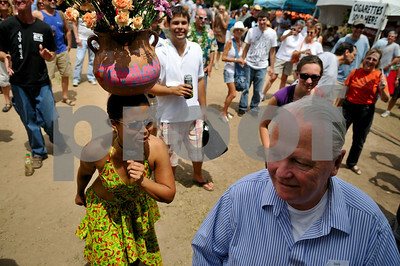 It aims to serve both workers and residents in the area and calls itself downtown Austin's corner grocery store. October 17, 2009 - A man dressed in drag rides a bike through downtown Austin along with hundreds of other costumed participants in The Tour de Fat, a one day festival celebrating the bike sponsored by New Belgium Brewery. 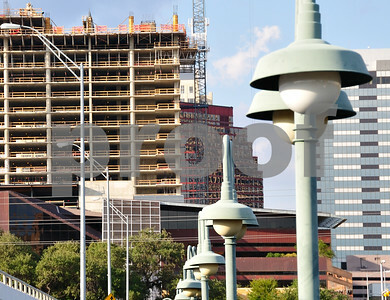 November 7, 2009 - Downtown Austin under construction as seen from the warehouse district. 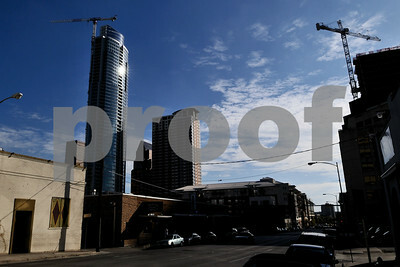 At 683 feet tall with 60 floors, the Austonian (left) will become the tallest building in Austin and the tallest all-residential building in the state of Texas. The Block 21 development (right) will include a 250-room luxury W Hotel, 250 condominiums, a 1,000-seat venue for Austin City Limits and an expanded Austin Children's Museum. 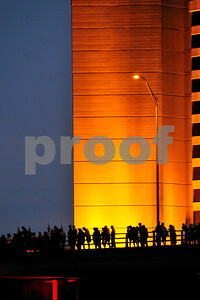 August 29, 2009 - Groups of people look out over the Ann Richard's Bridge in downtown Austin to watch the nightly departure of bats. 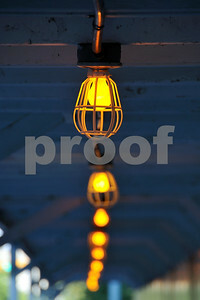 September 7, 2009 - Lights for the pedestrian walkway around the construction site for the Block 21 development in downtown Austin. The new building will include a 250-room luxury W Hotel, 250 condominiums, a 1,000-seat venue for Austin City Limits and an expanded Austin Children's Museum. 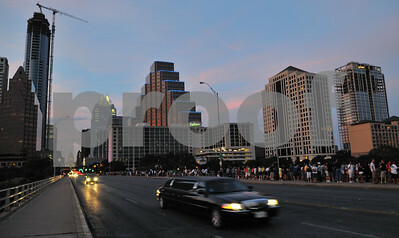 November 7, 2009 - The Frost Bank building stands on Congress Avenue in downtown Austin. 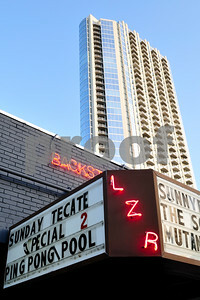 October 6, 2009 - The 360 building looms over La Zona Rosa in downtown Austin. 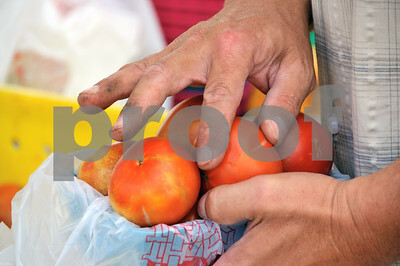 August 29, 2009 - A man packages tomatoes at the Austin Farmers' Market located in downtown Austin. 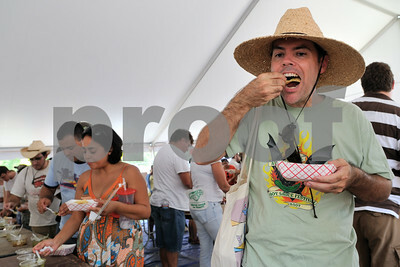 August 30, 2009 - A man tastes some hot sauce contest entries at the 2009 Austin Chronicle Hot Sauce Festival at Waterloo Park. 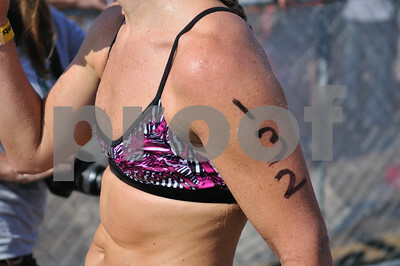 September 7, 2009 - A woman runs on the pedestrian walkway around the construction site for the Block 21 development in downtown Austin. The new building will include a 250-room luxury W Hotel, 250 condominiums, a 1,000-seat venue for Austin City Limits and an expanded Austin Children's Museum. August 30, 2009 - 2009 Austin Chronicle Hot Sauce Festival at Waterloo Park. August 29, 2009 - Austin Farmers' Market located in downtown Austin.